I don't believe that leverage is the only thing preventing Legacy from extending its credit facility maturity further. Legacy probably needs to pay down its credit facility via major asset sales to avoid a bankruptcy filing (which could involve liquidation anyway). Valuations for low-decline assets remain weak, but Permian deals have been picking up again. Legacy doesn't have the large contiguous acreage parcels that are prized though. Its largest acreage parcels also appear to be heavily developed already. I don't believe that reducing Legacy Reserves's (LGCY) unsecured debt will help it to extend its credit facility maturity further. The best chance for Legacy to avoid a bankruptcy filing is probably selling assets to pay down its credit facility. However, while the environment for Permian asset sales is improving, Legacy's scattered acreage and heavy development of its largest contiguous parcels will prevent Legacy from achieving the high end values cited for some Permian acreage. I suspect that Legacy's credit facility lenders don't want to continue carrying Legacy's loan on their books even if Legacy reduced its leverage to 3x or 2x. As well, there doesn't appear to be much interest from other parties to provide alternative first-lien financing (at a reasonable rate) to replace the credit facility. If that was a reasonable option, Legacy would have arranged the financing last year, similar to how companies such as Sanchez Energy (OTCPK:SNEC) and Jones Energy (JONE) issued first-lien notes to essentially replace their credit facilities. That leaves Legacy with asset sales as the primary method to address its credit facility. The market for low-decline assets appears to be pretty tepid. Harvest Oil & Gas' sale of its San Juan Basin assets was for around 0.47x PV-10 (based on late-2017 strip prices). I don't think the multiple would be hugely different based on current strip prices. Recent Permian deals such as Callon's (NYSE:CPE) divestiture of its Ranger asset and Chevron's (NYSE:CVX) acquisition of Anadarko (NYSE:APC) shows that Permian acreage can still fetch considerable sums. However, a key reason for the Anadarko deal was that it gave Chevron a "75-mile-wide corridor in the Delaware Basin" with Anadarko's large amount of contiguous acreage combined with Chevron's massive position. This will allow for very efficient development. Legacy on the other hand has many parcels of largely scattered acreage. Legacy will need to find many different buyers willing to pay decent money for various parcels of its acreage. As well, the small size of each parcel makes Legacy's Permian assets fairly common and thus relatively less valuable. It wouldn't be difficult to find other companies willing to sell a couple thousand net acres here or there. Legacy also did report 32 Upper Wolfcamp and 32 Lower Wolfcamp locations for that Lea County acreage as well. The Lower Wolfcamp locations could probably be considered more prospective though. Centennial Resource Development doesn't count Lower Wolfcamp locations in its inventory for the Northern Delaware Basin (from its GMT acquisition that includes some acreage to the south of Legacy's Lea County position). 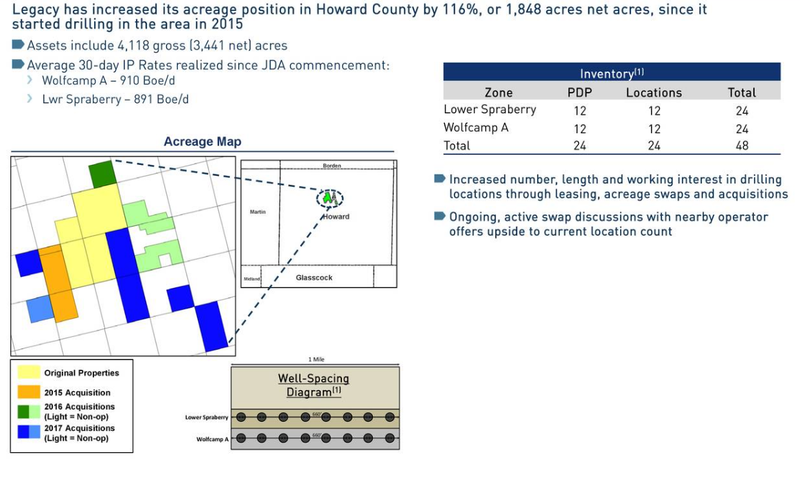 Similarly, Cimarex has not talked about the Lower Wolfcamp as a development target for its Lea County acreage. That part of Legacy's Lea County acreage is pretty good, but if there are only 32 gross Upper Wolfcamp locations that would be desirable to purchasers along with 13 gross Bone Spring locations, that would limit its value to PDP plus a relatively modest amount. For example, a value of $1.5 million per net location may only amount to around $49 million for the undeveloped portion of this Legacy acreage if the Lower Wolfcamp is considered just prospective still. 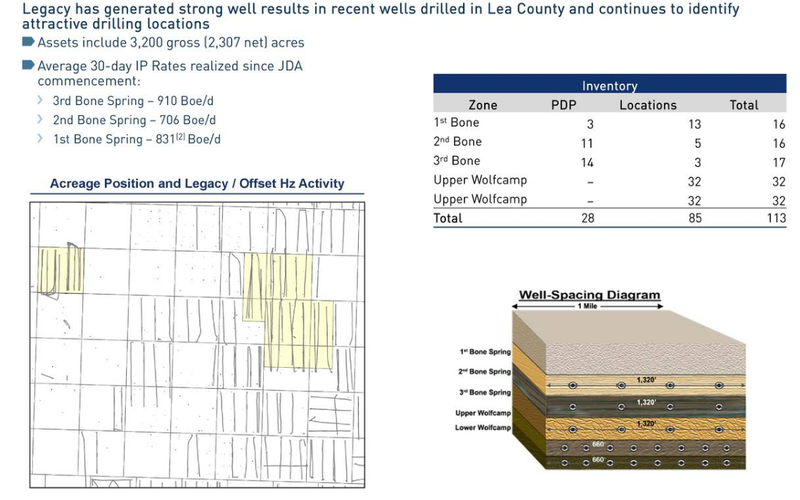 A look at one of Centennial's presentations shows that Legacy's Lea County acreage (that it has been focusing on developing) probably offers the best oil performance of its Delaware Basin acreage as well. Much of its other Delaware Basin acreage would be expected to produce less oil per lateral foot. So Legacy's best parcels (in terms of contiguous acreage and productivity) appear to be heavily developed already. Its other parcels (with more undeveloped locations) appear to be generally relatively small and some may have questionable productivity. That makes it likely that Legacy's Permian assets will average toward the lower end of the valuation range (such as Callon's Ranger asset valuation or below, rather than Anadarko's valuation). The lack of full-scale deleveraging attempts prior to Legacy's credit facility maturity suggest that leverage isn't the holdup to extending the facility. Legacy appears to need to pay down or refinance (with other first-lien debt) its credit facility. However, if Legacy could refinance it at a reasonable rate, that likely would have been done already. We are now left with asset sales as the main way of dealing with the credit facility. 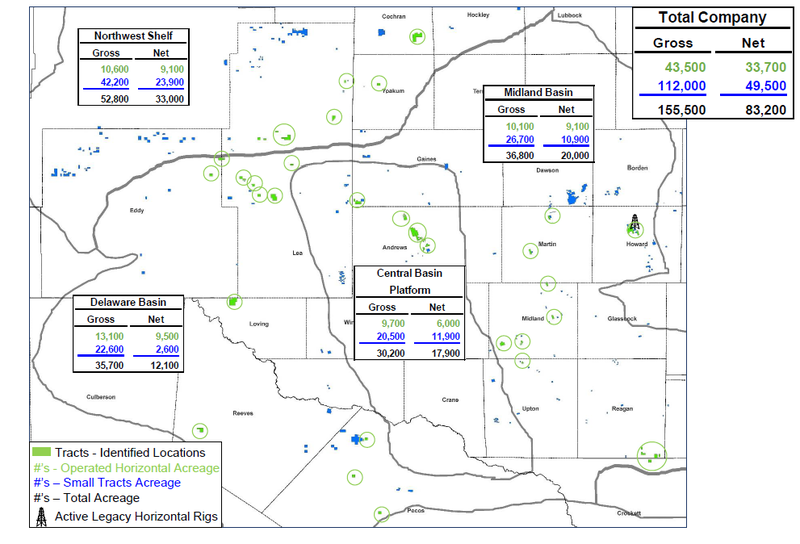 Sale prices for mature assets appear to be fairly weak still, but the activity in the Permian has been picking up. The scattered nature of Legacy's acreage and its heavy development of its largest parcels will likely limit the value of Legacy's Permian assets toward the lower end of transactions though.